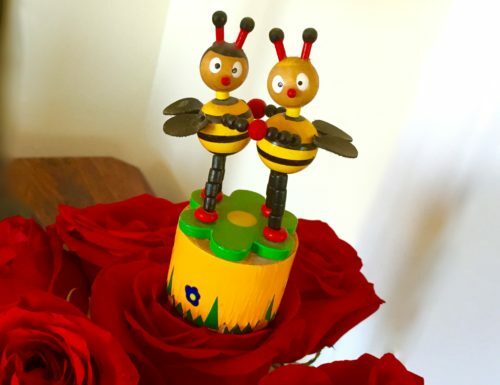 My affection for these winged marvels inspired me to create ‘Bee Cause…!’ on my blog. At Le Voov! 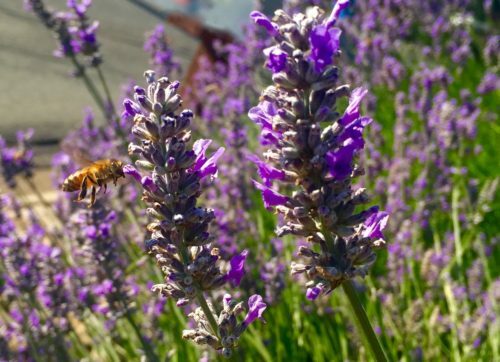 we will keep you abreast of the fabulous botanical options, research, and developments supporting our local pollinators. 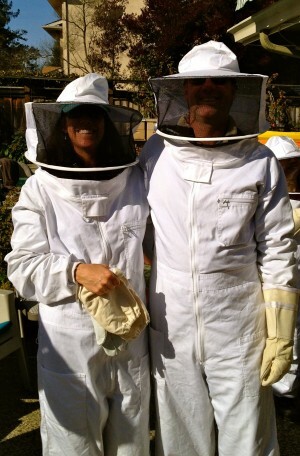 Brian and I took bee-keeping (apiary) classes with the hopes of putting forth our best effort to support the dwindling honeybee population in the world. 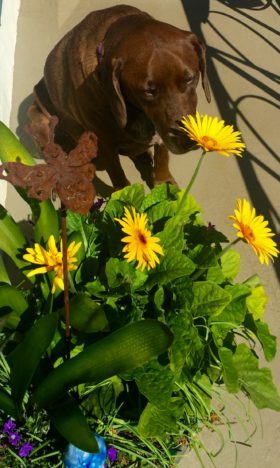 Unfortunately, we discovered that our rescue dog Otter-Pop likes to eat flies, bees, an occasional, unsuspecting wasp, butterflies and dragonflies as if they were simple window candy. So, we may need to rethink our hives for the time being…. Please stay tuned!!! Along the trail we noticed a large rosemary bush, blooming in all its glory with bright periwinkle blue flowers. As we got closer, we heard the familiar warm buzz of dozens of little honeybees, busily gathering food & water for their sisters back at the hive. 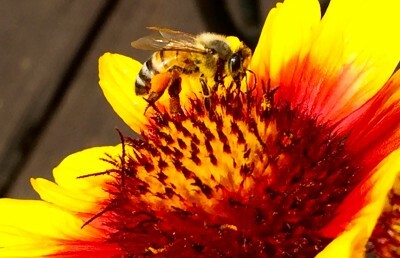 They moved quickly, methodically filling their tiny pollen purses before returning back home. 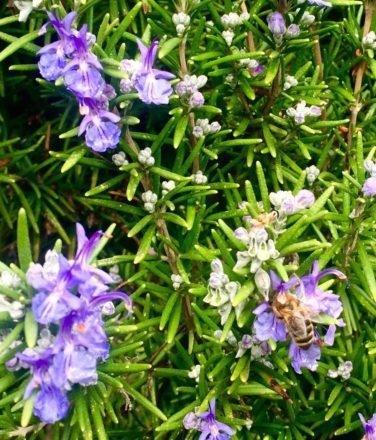 Rosemary is a wonderful source of year-around food for all our local pollinators! The hummingbirds were floating on the breeze, stopping at every flower like teenagers at their first kegger party. Meanwhile the honeybees were methodically making their way into the deep, cavernous foyer of the colorful Foxgloves and nasturtiums. First Bumblebee Of The Season In Our Garden! The most notable event of the day was the confirmation of a bumblebee nest in the ground of the northern garden area! Hooray, the gregarious, fuzzy, black winged B-52 bombers, with their sweet little yellow stoles wrapped around their shoulders created their home in our yard. What an absolute honor! Now this is not your average, run-of-the-mill mistletoe. Rather, a single Peraxilla plant can live for more than a century, producing a cluster of spectacular crimson buds each year around the time of the Winter Solstice. Strangely, the flower of this mistletoe species cannot open by itself, rather it relies upon a couple of birds in the honeyeater species to pry their buds open to pollinate. While this arrangement is convenient, it leaves the Peraxilla vulnerable, with it’s basic survival reliant upon another species. Under ‘normal’ circumstances, this shouldn’t be a problem. Sadly, the birds have fallen victim to several non-native species that have decimated the honeyeater bird population in New Zealand. (Thanks to the illegal introduction of opossums, rats, domestic cats and ferrets!) Thus, leaving the Peraxilla seeds unable to pollinate and multiply. With a mighty drum roll please, enters this cute little bee into our story. 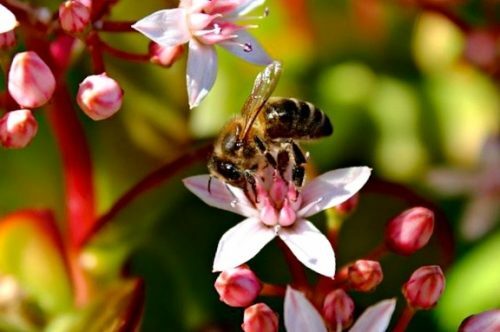 With a gallant effort to get to the golden nectar of the Peraxilla, the bee works tirelessly to open some of the crimson buds. And while it may take an immense effort for the Hylaeus bee to gain access to the flower’s stigma to pollinate, in recent years their herculean efforts have nearly doubled the number of fertilized seeds. Hence, providing New Zealanders with their beloved vibrant red Christmas flowers and mistletoe, while feeding a hungry bee population. So, here is a big shout out to all the teeny-tiny, itty-bitty Hylaeus bees for their altruistic, sweet effort to assist in saving the nearly extinct Peraxilla tetrapetala in New Zealand. Well done ladies!!!!! The initial permit was issued to Monsanto in June 2012 by Mexico’s agriculture ministry, despite protests from 25,000 Mayan farmers and beekeepers, as well as powerful groups such as Greenpeace, the National Commission of Natural Protected Areas and the National Institute of Ecology. At the center of the new ruling lies a stipulation within the Mexican constitution compelling the government to ‘fully consult’ indigenous communities prior to any decisions being made regarding individual territories. The judge ruled that the Mexican government violated the constitutional rights of the individual communities making up the Yucatán peninsula when they issued the original permit to Monsanto in 2012. Further, after reviewing the scientific evidence present against Monsanto, the judge declared that it would be reckless to introduce GM crops to the area because, based upon longstanding research, the honey bees cannot co-exist with GM crops. Current research indicates Glyphosate, an active ingredient in Roundup, could pose serious health threats to groundwater supplies, soil, microorganisms, humans, tropical flora, indigenous & migratory animals, as well as pollinators such a bees, moths/butterflies, birds, and bats. It should be noted, Monsanto firmly rejects these claims. The richly forested tropical climate of the Yucatán peninsula has been at the center of Mexico’s honey export industry, generating over 40% of the countries honey production over the last decade. The majority of the honey produced in this region is exported to Europe with an annual revenue of $54 million (£32m), making it a highly valuable industry to preserve. In 2011, the EU Court of Justice passed a landmark decision restricting any products derived from GM crops throughout Europe. Commercial planting of GM crops on the Yucatán peninsula would essentially devastate the much needed European export market for Mexican beekeepers. Bees watched the research bees perform tasks and get rewarded with nectar through a clear piece of Plexiglas. More than 60% of the observing bees correctly performed the tasks when their turn presented. Most importantly, even after the trained bee died, knowledge of the task continued to spread within the colony’s younger worker bees. This single act meets the requirement of a ‘culture’, which is usually reserved for larger, ‘big brained’ beings such as apes. This level of mental flexibility could help bumblebees across the globe respond quickly to emerging problems within their environment. Displaying an innovative thought process is critical in addressing issues such as human-caused environmental changes. For example, the loss of familiar flowering native plants due to the introduction of crops or other new food sources. Thank you to Chittka and his team for their dedication to better understanding the complex nature of bumblebee culture. Stay calm and buzz on!!! Stay Calm & Buzz On….! Most flowering plants have their pollen readily available for any and all pollinators to gather. But some plants are a bit more selective, prudish, even somewhat stubborn about whom they will share their nutritious golden treasure. 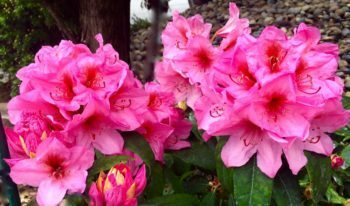 We’ve just learned about a pollinating technique called ‘Buzz Pollination’ from a video series produced by PBS called ‘Deep Look’. Chances are good that you have personally benefited from buzz-pollination through enjoying tomatoes, blue berries, cranberries, peppers, eggplant, potatoes, and thousands of other food producing plants. 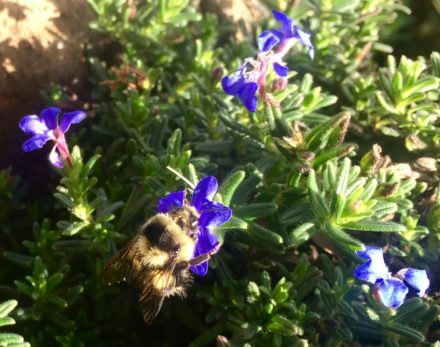 Discovered by Dr. Anne Leonard at University of Nevada, Reno, Biology Department, this bizarre method of pollination is exclusive to the mighty bumblebee. Interestingly, our beloved honeybees can’t do it! 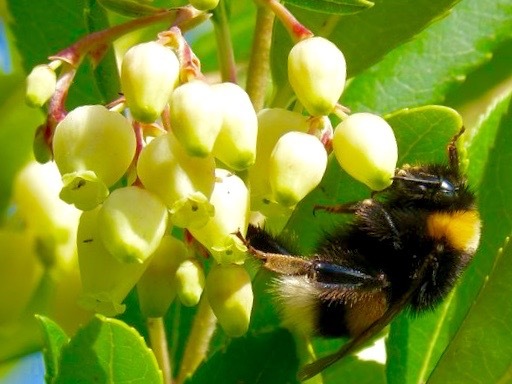 Certain plants do not attract pollinators with the gift of nectar, rather they hide their pollen deep inside their anthers, holding out until a suitable partner, a bumblebee, courts and forces it’s release. The bumblebee shakes the flower violently with her powerful vibration, until the anther opens, surrendering the prized golden pollen. Dr. Leonard’s research has documented that the harder the bumblebee buzzes, the more pollen she is granted from the plant. 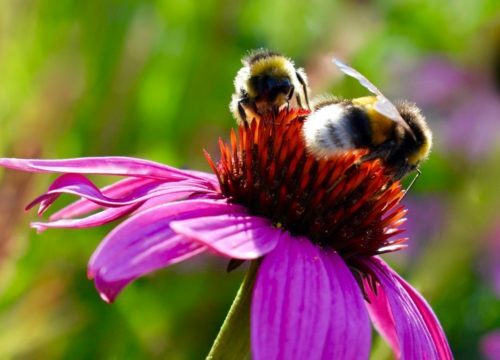 This unlikely evolutionary strategy is accessed by over 20,000 unrelated species of flowering plants, all dependent upon a healthy population of wild bumblebees for pollination. Le Voov! would like to thank Dr. Leonard and her team for their dedication and effort to finding ways to maintain healthy bee populations around the globe. 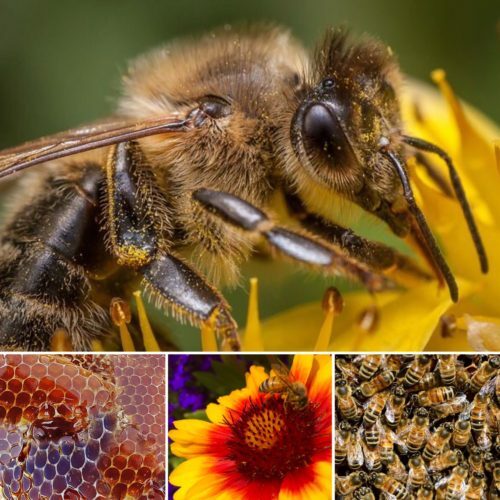 For more information on this topic, click on this YouTube link to see for yourself the truly fascinating dynamics of buzz pollination. Live long & buzz on bumblebees! We attended the annual ‘Flower Piano’ event this month. 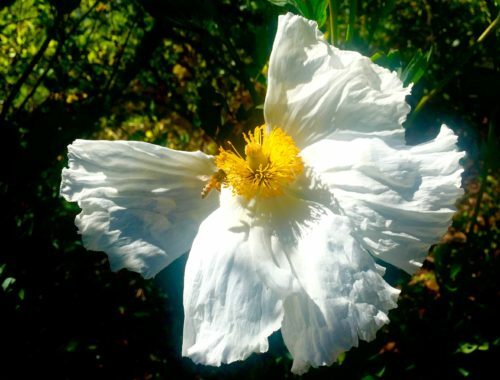 During our visit, strolling through the 55-acre San Francisco gem in Golden Gate Park, we saw over 5 different species of hummingbirds, fury bumble bees, honeybees, wild bees, along with numerous species of butterflies, not to mention a huge variety of botanical wonders from all over the world. While wandering through the gardens I heard the familiar hum of a hive emanating from the center of a huge shade tree. As I walked towards the tree, I could feel the excitement of a wild bee hive permeating the air. 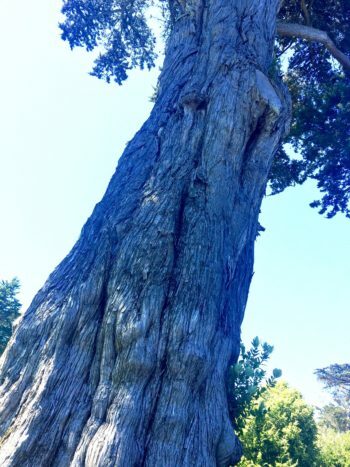 What was amazing to me, was with all the thousands of people attending this wonderful event at the gardens, it would seem no one else in the vicinity had even noticed the liveliness of hundreds of bees coming and going from the large crack in the side of that big tree. Ah, the gentle hum of the blooming privet trees filled with happy bees! 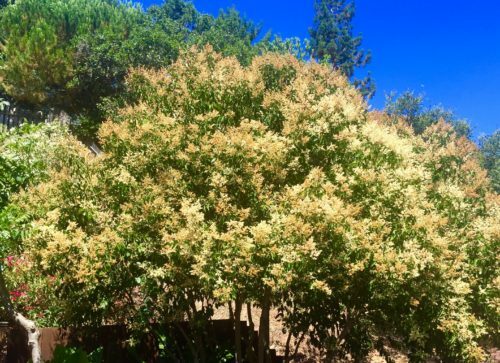 Every summer our Privet trees create a wondrous foraging ground for our local pollinators. (Yep, hummingbirds, butterflies, bees, and moths of all kinds & sizes!) I enjoy sitting in the garden, sipping my tea, and listening to the concert of deep buzzing produced by all the happy bees. It’s amazing to see the variety of winged beings these trees attract with their sweet scent. 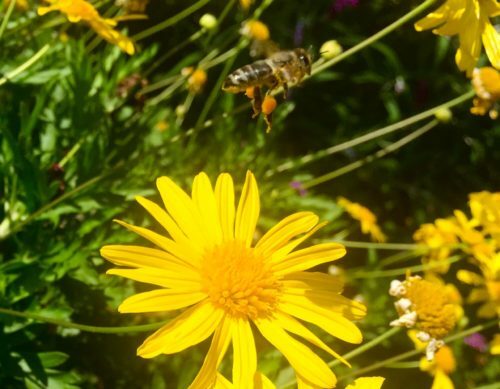 We see a dynamic blend of wild bees, bumblebees and various honeybees all happily humming away the day with their legs loaded heavy with pollen. 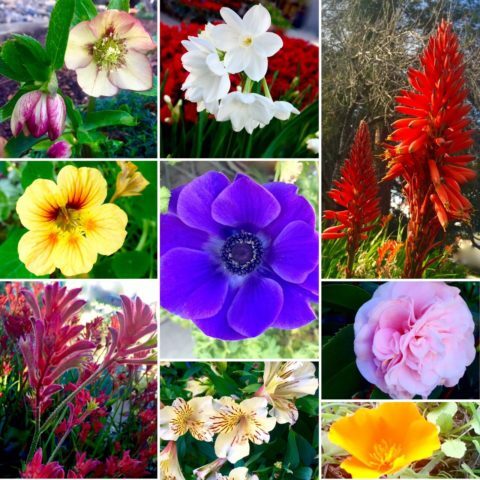 During this time of year, our yard is alive with activity from sun up to sun down! 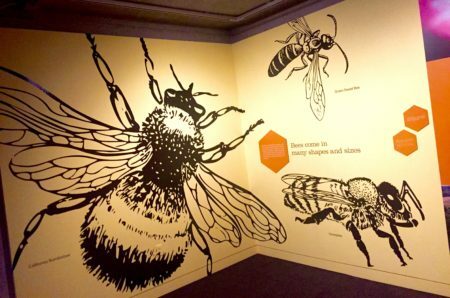 Bees need biodiversity to thrive. 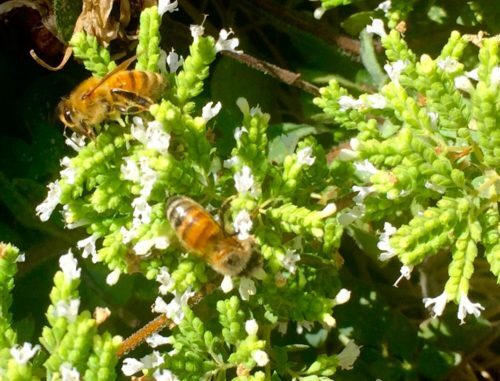 Having many different plants blooming throughout the year will ensure a steady food source for the hive. 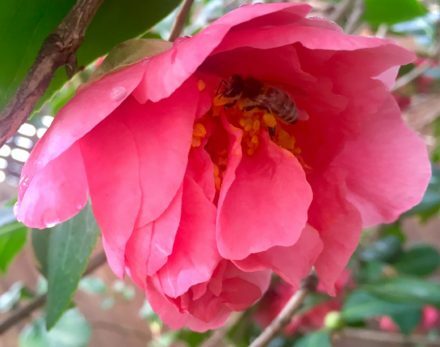 Our datura (Angel’s Trumpet), daphne, daisies, foxglove, camellia and azaleas keep our resident bees busy during the winter months. Please come back to learn more about bees soon!